Sometimes you can pick up the best tidbits of information when at the cycle studio in the wee hours of the morning. One day before class started, the instructor asked a regular about the secret to her beautiful skin. She sweetly spilled that she’d been a devotee of the Arcona line of skincare products for years. Once available only in West Coast spas, Arcona’s products are infused with enzymatic-based ingredients such as high concentrations of antioxidants, plant lipids and extracts, sea vegetables, essential oils, and vitamins and minerals. They never contain binders or fillers, chemical stabilizers, parabens, perfumes, dyes, or any other caustic, toxic ingredients—the closest thing to a natural product that I’ve ever used on my face! 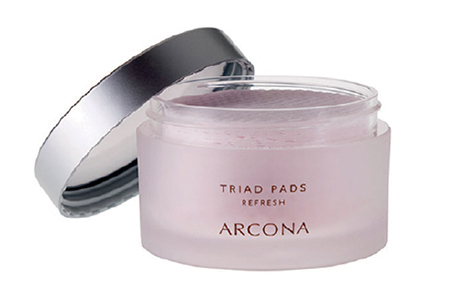 If you’d like to give Arcona a whirl, start with these refreshing Triad pads. Cranberry toner is imbedded in a convenient cotton pad that can cleanse, tone, and hydrate your skin leaving you with a sweet-smelling glow. Arcona products are available at nordstrom.com.